Nambe Pottery of Nambe Pueblo - Nambe English Pronunciation: "Nam-bay" In the Tewa language, spoken by the people of the Nambe Pueblo, the word Nambe means “People of the Round Earth.” Perhaps this is a reference to the landscape which encircles the Pueblo, with its spectacular beauty and the breath-taking view of the Sangre de Christo Mountains in the distance. Few places in the State of New Mexico are as enchanting as this area and the nearby Nambe Falls. The Nambe Pueblo is largely Hispanicized, and is almost completely surrounded by non-Indian residents, however, there has been a recent renaissance of interest in the traditional rituals and crafts, and the Nambe artists are making a comeback. Weaving is being revived in the production of kilts and cotton belts. Pottery too is once again being made in black on black and white on red designs similar to the work of the Taos and Picuris Pueblo Potters, however, the principal occupation of the Nambe people is farming, with some outside employment at Los Alamos. Fourth of July is the time for the most popular festival of the Nambe Pueblo, when they perform dances and other ceremonies above the Pueblo at the spectacularly beautiful Nambe Falls. Robert Vigil learned to make pottery from Lonnie Vigil and Virginia Gutierrez. Each piece is coil made with micaceous clay and micaceous clay slipped. 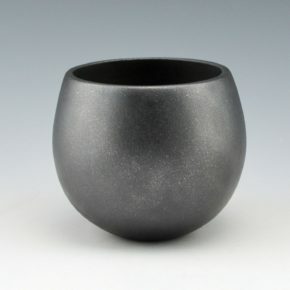 They are traditionally fired to create the black coloration. 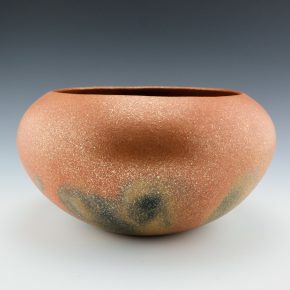 This is a classic bowl shape on which the focus is the firing and the coloration. The black varies from dark areas to nearly gunmetal. It is signed on the bottom in the clay. 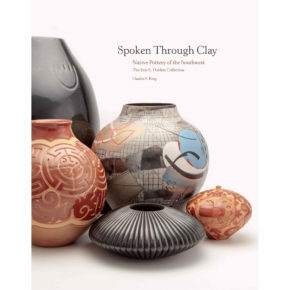 Robert Vigil learned to make pottery from Lonnie Vigil and Virginia Gutierrez. Each piece is coil made with micaceous clay and micaceous clay slipped. They are traditionally fired to create the black coloration. 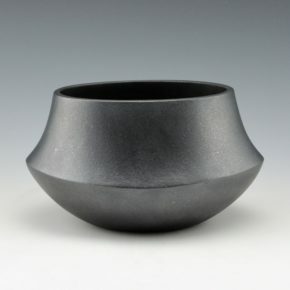 This jar has a sharp edge and an elongated shape. The surface is smooth and the coloration is striking. It is signed on the bottom in the clay.